In the beginning, the Early Years show Bernstein from his birth in 1918 through 1943 with one of the earliest photographs of him conducting (1941) a rehearsal at Lewisohn Stadium of the Lewisohn Stadium Symphony Orchestra (aka the New York Philharmonic). Here the diversity of Bernstein’s work is displayed in two back-to-back photographs; one showing the concentration of his work in 1945 as he is composing at the piano in his home, the facing page shows his enjoyment of his work in a mid-air “stop-action” photo. 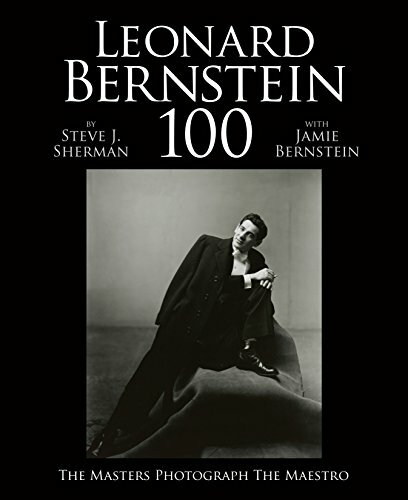 In the selections from 1970 to 1980, as he became the Man of the World, the quiet moments of Bernstein’s life become apparent in many photographs but there is a sense of adventure and fun in the photographs with other celebrities, close friends, and family. Introversion was certainly not in his character and among the celebrities he became close to were Jacqueline Kennedy Onassis, Aaron Copland, Isaac Stern, and Maria Callas. The photographs in this section express the joy he shared with friends such as these. In the chapter “1980–1990: The Final Years,” the photographs are poignant recollections of this man’s amazing life, and if a photograph can bring tears, it would be the last one in this section. “August 19, 1990, Tanglewood, MA. Leonard Bernstein leaving the stage for the very last time after conducting the Boston Symphony Orchestra to Beethoven’s ‘Symphony No.7,’ his final performance.” Leonard Bernstein left the world on October 14, 1990. Yet the book does not end there. The last section is “The Man, His Music, and His Mind” and it focuses on his musical writings, his correspondence, and even his doodlings. As we turn the last page, we are left with a sense of knowing this man, and being a better person for it. This is a book that is read once, and then once again, and again—each time gaining new insight into a true maestro.